Amit Madhan is an Economics Honours from Delhi University, post which he did MBA from Sydenham College, Mumbai. Amit Madhan has had an impressive track record of over 18 years, having worked extensively in the Financial Services and then the Travel industry. He is working in the eCommerce space since 2007. He was a founder member of ICICI Lombard and is credited with having set up icicilombard.com- the pioneering E-Commerce portal in the insurance space. 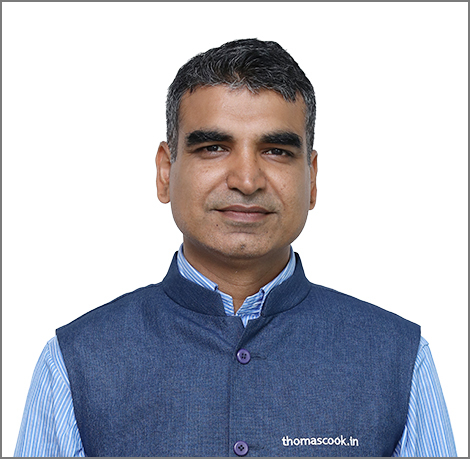 Amit joined Thomas Cook (India) Ltd in 2012 and is responsible for the diverse portfolio of Technology and E-Commerce. His passion for customer experience is driving him to digitisation and implementation of new systems to enable different businesses in the Company for smoother operations and customer acquisition.